I had mixed feelings about The Martian (I like the movie better) and I feel the same way about this book. Weir had a real opportunity having his main character be a Muslim woman but instead he basically turns her into a criminal terrorist...not the best idea in this day and age. I liked that the Moon is ruled by Kenyan's and that the welders are mostly Arab etc...at least the characters were other than your average white people. 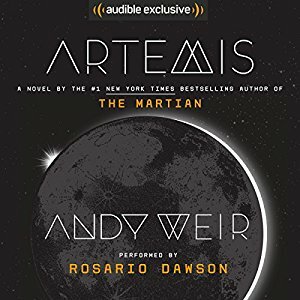 So this book's makeup really gave it a different twist and while I don't want to give away too much lets just say there is some redemption but Weir really could have though that through a bit better. Jazz is interesting and at first seemed one dimensional but she does have some depth. Her humor is more in line with a 17 year old boy than a 26 year old woman which can get annoying but the story carried me along past it although I did have a hard time remembering she was 26. The supporting characters were interesting and there was a lot more to this story than what I first thought. The twists really left me listening more and more. Weir likes his science and will take any moment to go into detail of many different things that flew over my head and seemed to drag on a bit too long (I don't think I will be welding on the moon anytime soon but now I know how). Overall this is a pretty interesting book. While Jazz's personality needed some work I think the story was well done and the world Weir built is interesting. Rosario Dawson was a great choice as a narrator. Her reading really brought Jazz to life and helped me connect to her despite her juvenile personality.